Workout advice is everywhere right now. If Tyson Poultry loves November and Hershey’s loves February, people in the fitness industry love the start of a new year. Many people drop off from their fitness routine because of colder weather or busy holiday schedules. This time of year trainers start to evangelize on the finer points of exercise to get those people back into the gym and over a workout plateau. I’ve gleaned through a lot of this advise to find the best tips I can proselytize for you to jumpstart your fitness or make progress toward your goals and overcome a plateau. If you have a treadmill or bike or elliptical trainer in your home you can’t help but see results on your workout plateauk. Hop on the machine and catch up on the news or a movie you’ve wanted to see. With a DVR or On Demand services you can break up your cardio in 10 or 15-minute increments. Or if the movie is that good you can double or triple your daily workout. If you’re already using a cardio machine at home or the gym you can punch up your cardio by adding intervals. After warming up go hard for 30 seconds and then a moderate pace for two minutes. Time will fly by while the calories burn off! You can also grab some weights and do some arm exercises to incorporate different muscles while you walk. Tips for Your Workout Plateau! These are both great exercises that use muscles from head to toe and strengthen the core. Perform a plank with proper form, elbows under shoulders, tummy tight, knees straight and feet flexed. Challenge yourself to add 5 or 10 seconds each week. Or punch them up by adding a balance challenge with alternating toe taps or lifting opposite arm and leg. Yes, these are hard but good and can move you from your plateau. Push-ups add the extra element of working more muscles in arms and chest. Once again, shoot for good form similar to the plank. Then try to reach your full range of motion lowering all the way down with elbows at 90-degrees and then push up. Once you’ve mastered good form you can increase your repetitions. If you’re already good at push-ups add squat thrusts into push-ups 10 to 12 times. Rest and repeat once or twice. Many agree the row machine is one of the most efficient cardio equipment devices in the gym. 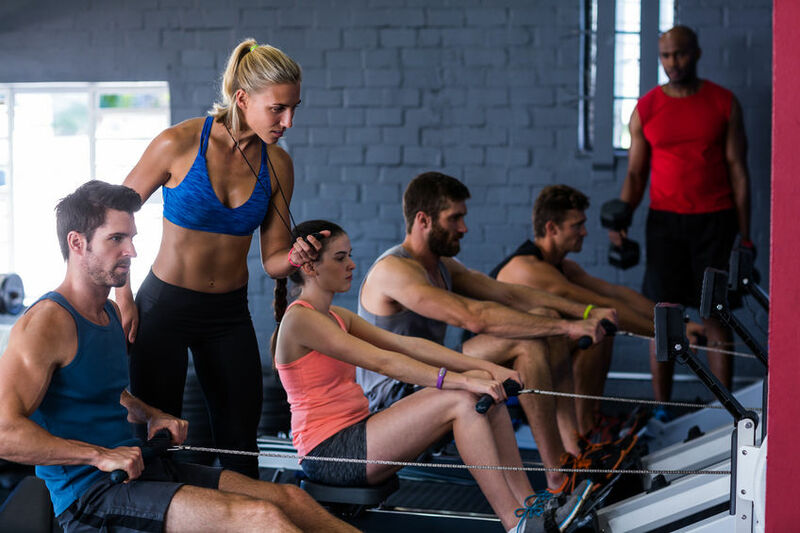 It mimics rowing a boat and requires a lot of core strength as well as legs and arm muscles while you build up a sweat. Plus, it’s low impact on the joints making it accessible to young and old. Like running or cycling, start slow trying it for 10 to 15 minutes. Increase time and speed each week. If you don’t have access to a row machine you can mimic these movements with a tubing band. Place around the arches of your feel, bend knees slightly and pull tubing toward you for upper bodywork. Add lower bodywork by bending knees and straightening as you pull tubing back. I like to set a timer for 30 seconds or one minute on, rest and repeat. Finally, nothing beats the real thing. If you have access to a canoe and water that is the most fun. I tell my clients to challenge those large lower body muscles. They are the engine that make you go. Strong gluteus, hamstrings and quadriceps muscles will build strength for other activities, especially cardiovascular exercises. Plus once toned, they will burn the most calories at rest. There is a plethora of lower body machines at the gym and any trainer will be happy to demonstrate. Or basic lunges and squats will do the job. You can start using body weight performing 16-20 squats and lunges at a time. After resting perform a second and third time. Then you can progress by adding weights. Or challenge the fast twitch muscles, used for maximum exertion, with jump squats and lunges. Mind good form and thoughtful landings to avoid joint injuries. To see results on your workout plateau add to your routine at least three times a week. Many aging, tired athletes like myself are finding their way to the yoga room. Yoga is a gentle way of strengthening your body and keeping your spine and hips mobile. Flowing through yoga poses bends and twists your spine in every direction allowing it to stay limber and receive fresh oxygenated blood. Yoga also includes a lot of hip opening postures that also bring relief to the spine and lower body. At the very least people who exercise a lot should take the time to stretch all body parts and especially the hips and spine, holding stretches for 30 seconds or more. Find a yoga class, let the teacher know you’re new and start to explore your body for the sake of its longevity. On the topic of yoga, it has built into it a resting period at the end. It’s a chance to relax the muscles and deepen the workout. You should also allow yourself to get enough sleep at night so your muscles can recover properly. The healing and rebuilding happen while you are at rest. It is also important to make sure your body has enough hydration and protein to aid in muscle repair. Find a way to make sure you’re drinking water all day. Make healthy food choices of fish and low fat protein, accompanied by vegetables and fruits. Also watch the portion size and added sugar that can slow your fitness progress. These changes can positively impact your workout plateau. If you’re looking to make big changes in your body these are workout plateau suggestions I’m sure most fitness trainers would put in the top 10. Be sure to consult your doctor about fitness and diet.